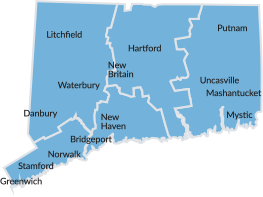 The Connecticut River, centerpiece to the River Valley region, soothingly meanders from Suffield to Old Saybrook. Along the way, visitors can stop in Hartford, the Constitution State’s Capital, for a glimpse of Connecticut’s history, or explore the River Valley for rest, relaxation and family fun. National Historic Landmark featuring Jurassic-period dinosaur tracks and a diorama depicting the setting in which the park's tracks were made. New Hotels, Restaurants and More! More than 10,000 American works of art from 1740 to the present. Statewide, Locations and times vary.